A wolf-like animal was shot in New Brunswick last week. 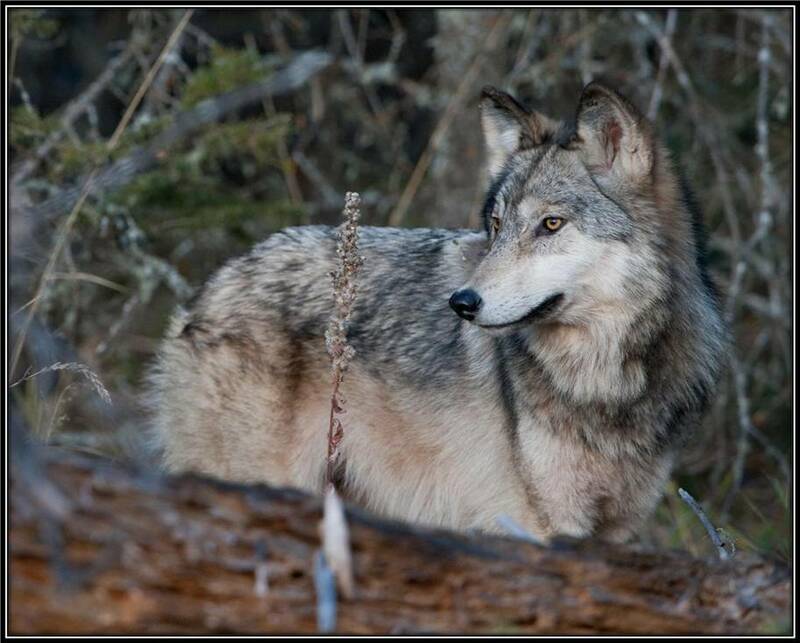 Wolves are considered extinct in the Maritimes and one has not been observed in the province for over 100 years. Wolves were historically present in this area, however they were extirpated primarily due to competition with humans. The Eastern Coyote is common in the Atlantic region and tends to be larger than their western cousins. It has been proposed that the large size of these animals is partly due to past inter-breeding with wolves. DNA analysis is underway on the animal shot in New Brunswick to determine its species. I’m not one for this type of arena but I feel so privilaged to have seen a wolf just off my property, along the tree line in the field/brush, only visible for maybe a minute. Had I not had my binnoculars I would not have known for sure, I only wish I would have had a real good camera with zoom lens to capture the image I saw thru my binauculars. I don’t want anyone to know the area for fear they want to shoot it. while driving to Ontario in 2011 near dusk, my wife and i (just outside of grand falls by the number 2) saw what I thought was a very large wolf-coyote hybrid standing by the road. But the distinctive grey-brown pelt, and very very large size made me think it may have been a wolf. I’m from Nova Scotia, and used to do quite a bit of hunting and have had several first hand experiences with Coyotes (alive and dead) from Nova Scotia and know them well. This made me quite sure that what I saw standing very close to the highway (when I put on the four-ways and slowed down the animal and I made very brief eye contact before it turned and trotted back into the woods) had to have been either a wolf-coyote hybrid (that was much more wolf than coyote) or an actual eastern wolf. Its very large size, and its pelt were quite different from what I was used to seeing from coyotes. I am also painfully aware of the wolves being extinct around our parts for some time, so I searched the internet looking for any sightings of wolves and found little. This string of stories in recent months makes me think that i might have seen actually seen either a large wolf-coyote hybrid or a pure wolf in New Brunswick. (I have been insisting that this for two years now and have gotten a lot of laughs, and “sure buddy”‘s) Hopefully we’ll find out more in the months and years to come! We were driving up a back road that we travel all the time and saw what we thought was a small moose. The closer we got, we thought it could be a coyoty. We got a little closer(100ft. from truck) and it wheeled in front of us we realized that it had to be a wolf by its size and color. I live in a condo in Fredericton North, right on the Saint John river. Yesterday morning (5 Feb. 2014) I saw what I thought looked like a wolf out on the ice. I watched with binoculars for several minutes. It was not a dog and too big to be a coyote. Any thoughts?? As you know from the article, the Eastern coyote can be quite large compared to their western cousins, however it is also possible that it was indeed a wolf that you saw. Unfortunately it is impossible to tell for certain, however you may want to consider reporting this sighting to your local Natural Resource office http://www2.gnb.ca/content/gnb/en/departments/natural_resources/Regions.html as they may want to further investigate this sighting. I think that I have encountered your wolf. It happened on Thursday, Nov 13, 2014 at approx. 3:06pm. I was out walking our dog (a large 85lb pit-bull) through a wooded area on the North side of Fredericton, the woods seemed unusually quiet and my dog kept stopping and listening (a couple of times she stopped and looked behind us). We were in an area that is a combination of sand and pine needles and so you make very little sound while you are walking. In that area the ground to our left is quite a bit higher than the ground we were walking on, and ahead of us, about 25 or 30 feet, there was a trail that paths out of the woods and down to the lower sandy area. I had just stopped up and was adjusting the dogs leash on my wrist (the dog was listening again – looking up to her left) when leaping out (from our left) on that trail in front of me came this huge creature. I froze and everything slowed down. The animal had a beautiful full coat of grey and fawn coloured fur and a thick tail that darkened near the end. It was quickly out of my sight and I stood still for a couple more seconds wondering (and fearing) if there would be more of them. Needless to say I started to back away, out the path we had come in, and glancing down at my dog I thought that in comparison to the creature I had just seen – my dog looked like a puppy. I left the woods as quickly as I could. When we got back home I checked out pictures of coyotes and pictures of wolves. I would put my money on the wolf – it fits the body size, the face and ear shapes, etc. Hopefully it was just one of those once in a lifetime things – it was beautiful to see but also terribly frightening at the same time. I’m not sure as to when I’ll be up to walking through there again.